Vancouver: Secrets of the City was a #1 bestseller in British Columbia when it was first published in 1998, going through three printings and selling nearly 15,000 copies to folks with a yen to know about the city's vast collection of secret tunnels, hidden scandals, forgotten romances and truly hidden spots to dine. It was shortlisted for the City of Vancouver Book Prize. 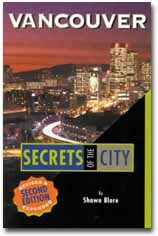 Vancouver: Secrets of the City Second Edition include new stories, anecdotes, and little-known facts about Vancouver, from notorious scandals to diner dining and everything in between. Witty, informative, and more than a little irreverent, Vancouver: Secrets of the City, a book for both hometowners and tourists, will have you talking.